Are you tired of slipping or almost slipping on your stone steps? Welcome to the Handy Squad. Even if the stone steps in your front or back garden don’t seem that dirty, they will often accumulate a tiny layer of moss that will make them slippery in the wet, particularly if they have a smooth surface – which could be a terrible hazard. Let the Handy Squad give these grubby steps a blast with the pressure washer to give them a better look and a better grip. Our team of patio cleaners in London are able to pressure wash a variety of surfaces, from pressure washing brick steps, pressure washing concrete stairs and jet washing stone steps. Still not sure yet? Simply request a free quote today by filling our online form or give our team a call on 0800-0-12-12-12 and we’ll help with any queries you might have. At the Handy Squad we have a highly-experienced stone cleaner team will be with you in no time. 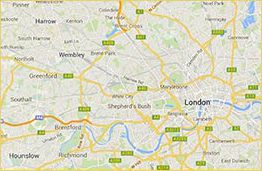 We cover the whole of London in our unmistakable yellow scooters and vans and we offer pressure washing services in Ealing, pressure washing services in Wimbledon or in any other area of London you live. Perhaps you have grimy and dirty concrete stairs that need a good wash, but you don’t have time to do it yourself. Perhaps you arranged a garden party in a few weeks’ time and just noticed how grubby your brick steps look or maybe you need a professional to pressure wash your stone walkway and steps – our team will any job with efficiency and in a timely manner. Note that our team will need to connect the pressure washer to your outside tap. In case you don’t have one, perhaps ask your neighbour if they can run a hose over the garden fence. It is very difficult to connect to an indoor tap given the high pressure generated by the machine. Besides jet washing steps, our professional team are experienced in filling in between paving slabs, restoring wooden garden furniture, cleaning wooden garden furniture and pressure washing patios. Feel free to give our outdoor stone cleaner team a call on 0800-0-12-12-12 or simply request a quote by filling our online booking form.